I've thought about this a bit. Rusty was a francophile--we used to play around with the French language. I'm a dabbler, conversational at best. He was fluent. I think the title of this thread does him honor. It comes from the French colloquialism of the Napoleonic Wars--il est casser sa pipe--he has broken his pipe. Let's remember him without sadness and without fear or trepidation. The Lord has myriad ways of bringing us to Him. Rusty was a scientist. At that last Great Trump, when every man gets his last chance, are we to believe he didn't acknowledge Truth? I wasn't his best friend. We didn't agree on much except tobacco. But I do think we should put aside the sadness and the hagiography and say he was one of us and therefore a good man. He's in a better place. As humans, we only are really capable of mourning our own loss. And what's that, when it comes to it? Everything he wrote is still here. That's a priceless gift. Rejoice in it. I just saw this news and was devastated, in tears, and broken hearted. Of all of the fun and frustrating conversations both here and in the PM world, the one I got the biggest laugh out of was an exchange a few years ago when the sock puppets were flying. I proposed that Rusty was actually my sock puppet! You can imagine how well that sat with him. He made a witty sarcastic comment and I retorted once, then he was silent, and no matter how much I tried to prod him, he never responded again to the concept. I thought surely I would at least get a cease and desist private message from him, but ... nothing! I think he was so offended at the thought that he could in any way have his knowledge and wisdom associated with a nitwit like me that for possibly the only time I ever communicated with him... he was speechless. Like so many here, we had many fun and frustrating exchanges here and in pm, but as others have said, I am a better man and have more clarity and depth in my faith as the result of his constant questioning and challenging of my every word. I also learned more from his posts than I could have EVER learned anywhere else on earth about pipes and tobacco. 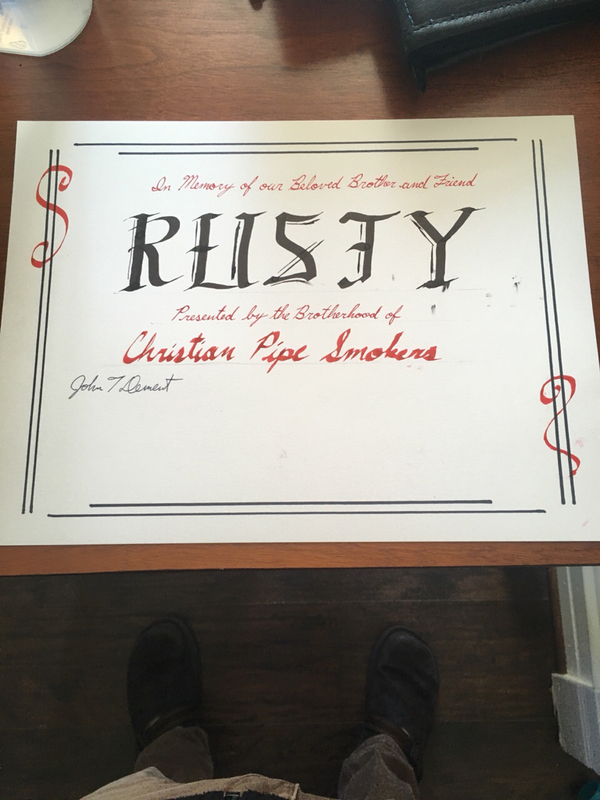 This forum will remain the most informative compilation of pipe and tobacco knowledge anywhere on Earth in a single place for as long as there is an internet, and I am sure that all here would agree that this statement is absolute fact and would not be so except for the contributions of Rusty. I will miss you and I am praying right now for your family. For their peace and comfort and healing at the loss of you, Rusty, their dear Husband and Father. I still don't think of Rusty as dead. I still expect when I check in on CPS that he's going to have posted something interesting and then I remember. I suppose it will fade at some point, but it's no stretch to say that his posts were always at the top of my list to read. OMG I am ashamed for missing this sad event. Prayers of comfort for Rusty's family! He contributed SO MUCH knowledge, Rusty's expertise will certainly be missed. Today, in his honor, I will smoke my full-bent Savinelli with a horn shank, which I received (ironically) when I purchased a collection of 22 pipes from the owner's daughter. She didn't care what they were worth, just wanted them to go to a good home because her dad had enjoyed them so much. Anyway, I know that this pipe has a horn shank, because Rusty told me how to test for it, and then assured me that it alone was worth much more than the $45 I had paid for the lot. Good-bye Rusty. I'm praying that Jesus nabbed you in the last moment. Last edited by Jake on Sat Jan 20, 2018 4:25 pm, edited 1 time in total. Last edited by Kerdy on Sat Jan 20, 2018 3:12 pm, edited 1 time in total. He'll show up one of these days, along with Elvis and Andy Kaufman. Haha. Rusty sightings. That would would be cool. Just saw this today. I’m not sure I ever directly interacted with him, but I learned so much from his knowledge here. I’ll miss him. Praying for his family; I hope that he found Christ, in his own way. Last edited by Thunktank on Thu Jan 25, 2018 12:26 pm, edited 1 time in total. In my absence, I just found out about this a few minutes ago. Truly, truly saddening. He was a good friend and we shared so many long PMs over the years. I was one of the few who often agreed with him about topics other than pipes and tobacco. He was truly human, a man insightful and always curious. No matter where I was on the Christian or atheist scale, he had something helpful to add. He also loved to ask me why many of the rest of you would do and believe like you do! Half the time I was as mystified as he was. But he really did like thIs place even when frustrated by it and he hated it when people would leave. ThIs really hurts. I’ve been feeling this too much lately. Lord have mercy. I don't believe I ever had an exchange with Rusty on this site. He must have joined after I had already started to check out some years ago (regretfully). I do feel that I've gotten to know a little bit about him because of how much I've seen his name everywhere, on various threads, over the last couple days. I just wanted to express my condolences to you all. Although I don't share your feelings of the loss of a friend, I do feel the loss of having never met him. There is a longshanked Upshall on eBay with an L stamped on it. Neither the Upshall webpage or the google tells me what that designations means. I knew one person to ask in this situation. I'm seeing this posted a lot around the forum lately, what does it mean? Why are there boxes hidden content messages that only indicate a location? I asked folks who commented on the thread I started about Rusty's passing to indicate where they were from. Some folks don't wish the general public to know where they are from, so they graciously provided the information but by marking them as "hidden" only logged in CPS Forum members can see that information. Thanks, yes, that clarifies it.